In addition to 4 miles of walking trails that beckon visitors to on an adventure over streams, through prairie grasses, and to the edge of Homestead Lake and Overlook Pond, visitors now may enjoy a Nature Explore Classroom. 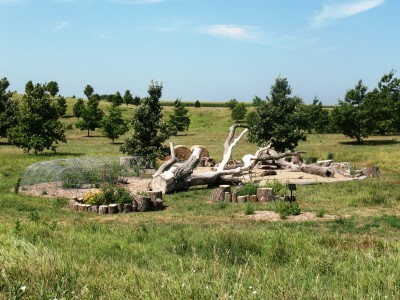 The Brenton Arboretum in Dallas Center, IA has created The O’Brien Nature Play Area for all visitors to engage in activities that connect them with nature. Wanting to feature as few implied toys/tools as possible, the Nature Explore Classroom allows unstructured play; not limiting visitors, but encouraging them by suggestions. Care was taken to construct the classroom out of almost entirely plant-based materials and to incorporate some new techniques for containing soil and ground cover. Curved, wire cattle panels form a trellis, creating a tunnel of Boston Ivy while soft and ultra-durable erosion-socks border the sand floor. These erosion socks are expected to last 10 years based on salinity, UV and traction tests in the lab and in the field. 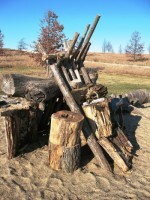 A “fort” structure was built by a group of boys on a warm October evening. Since then, it has undergone several reconstructions, but most children adore it and maintain it as though it were a revered historical building! New hay bales are generated annually from the tall grass prairie located at the Arboretum and labor for baling is generously donated. Most of the materials are gathered and replenished from trees on site while others were donated from a local tree care company. Background information about most of the deliveries is shared with the staff which means that each stump, log or tree has its own true story. The initial design was completed with advisement from Green Hearts who included a variety of natural play structures and all the areas needed for certification as a Nature Explore Classroom. Additional enhancements, including the strengthening of path structures, borders and spacing, new perennial beds and the living tunnel were designed by Lynn Kuhn, arboretum director, and registered Landscape Architect. 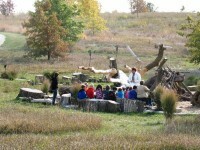 Family Play Date groups meet once each month at the Arboretum. These early-out activities offer seasonal activities such as leaf-rubbings, pond dipping, and binoculars for bird watching. When reaching out to the surrounding community, the Arboretum tries to emphasize natural play and the importance of having these activities available to every one of their visitors.